I finally finished my painting, and I am pleased with it. I finally found a good reference for a calf and I believe it worked out perfectly. I hope you all like it. As always, I liked the white background, but wanted to add more detail. I just didn’t want to add so much to the background to take away from the figures themselves. I finally found a way to add just enough at the bottom and sides to depict the foliage and hills in the distance and tree branches above to make a sort of frame surrounding the figures. I must say I was so excited when I figured out how to do this! Now I also have some space to place a small inspirational quote if I like. I am happy with this and can’t wait to start another…but this took way too long! Anyway, I have also just placed this on my Etsy Shop if you are interested. If you like the print and do not place an order online, please email me at mcprop@cox.net and we can work something out. Have a great day! Hello! 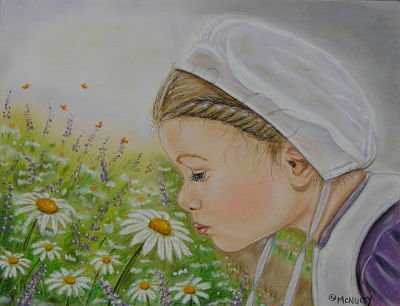 I finally finished my watercolor of the Amish girl. I am so sorry it took so long, but I was actually afraid to paint this picture, as I know that once watercolor goes on paper, you can’t really correct it. What you see is basically what you get. I am not used to that at all! I also am not used to all the layering it takes to get vibrancy in a painting, as when you use pastel, it’s usually vibrant on your first stroke! Anyway, I was very cautious and did make a few mistakes that I did correct in my own way, but I’ll just leave it at that. I also wasn’t planning on a whole background scene for the girl either. I was just going to add light colors around her and leave it, but that didn’t happen…as you can see! But I really wanted the focus on her face and I think I achieved that anyway! Phew!!! Am I glad it’s over…until the next one…”gulp”. 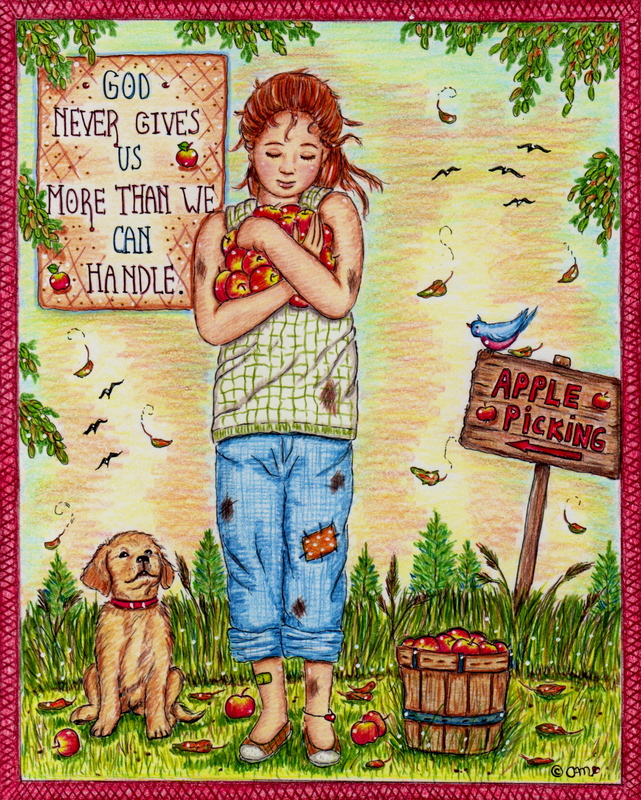 Here is a colored pencil illustration of one of my favorite quotes. It was done awhile back, but I thought I would share it again, as it seems to be a favorite of many people out there. 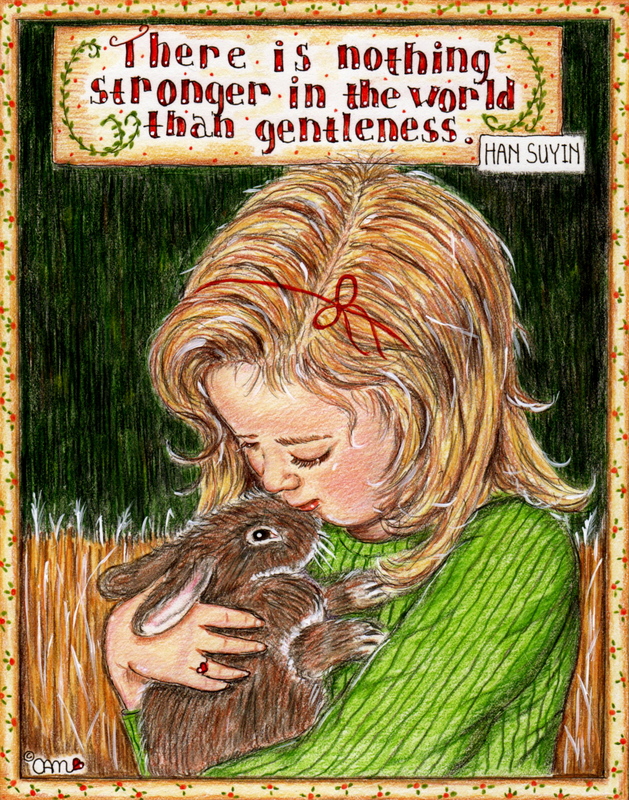 I think the innocent, little girl holding the bunny was perfect here as she cradles the most gentle of creatures I could think of. I think it illustrates the quote rather well. I hope you like it. This is my favorite painting for the Christmas season. 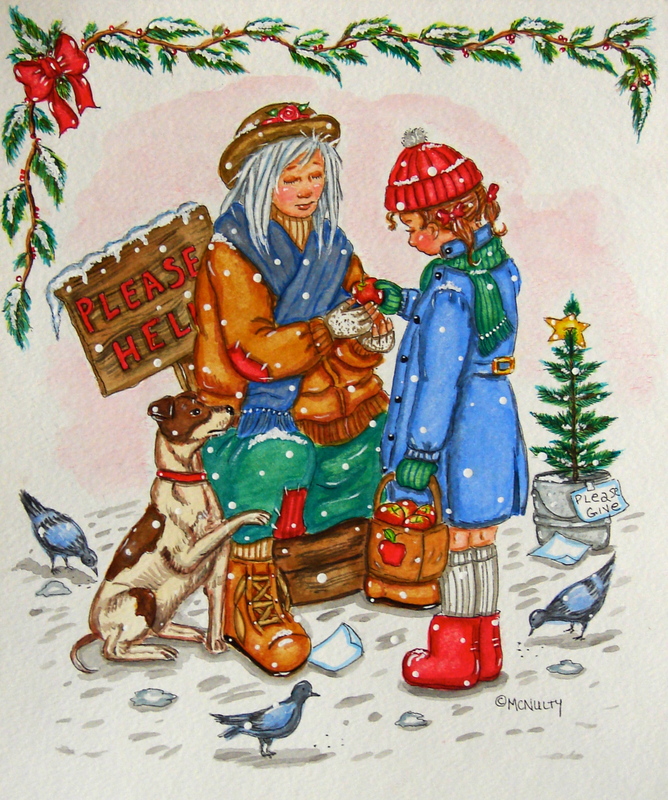 I like it because it’s really not cutesy/sweetsy, it just expresses what the Christmas season is all about, in just a simple drawing.Just the interaction between the characters in the painting expresses the spirit. I hope you enjoy this painting. Hello, everyone! 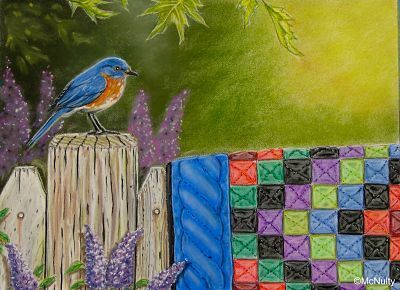 I am in the process of doing more pastel pictures,but in the meantime, I dug up this colored pencil picture I had done several years ago. It has a Fall look to it, and I just love the quote, so I thought I would just post it. If anything, the quote is much needed today with all the horrible news lately, don’t you think! Enjoy! Just finished these two Amish-themed designs. I think I am happy the way they turned out. It was very different than what I am used to. I left space in both paintings for an inspirational quote. Hope you enjoy these! This picture was done by me many years ago. 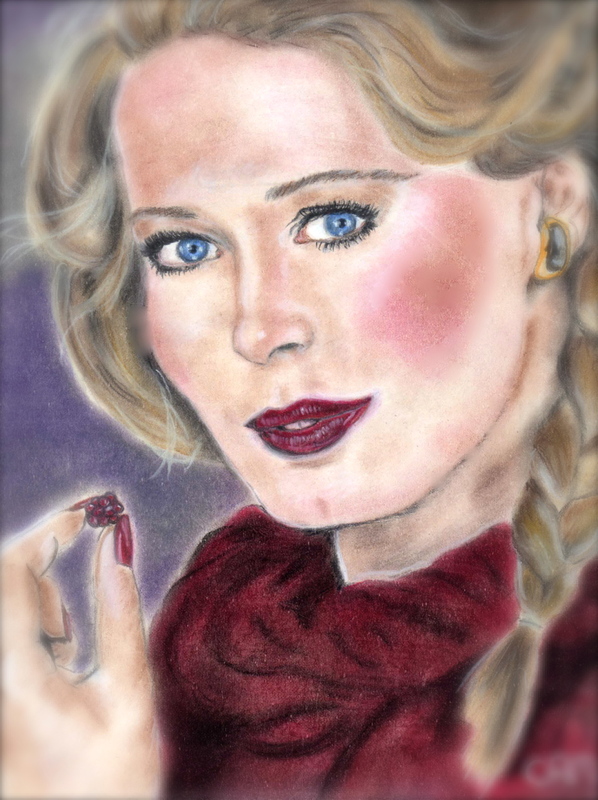 I had a box of chalk pastels, regular drawing paper and a pic from a magazine (probably Seventeen Magazine) which was an advertisement for lipstick. I just applied color to the paper like I would have done make up. I did not know all I know of the tricks for getting the hair to look like real hair or really how to apply colors…I didn’t even know about pastel pencils for fine lines…even if they had those then. This was probably done about 1975/78 when I was 18. It’s amazing to me to even look at it now, to think I did this even then. Funny!